Citation Information: J Clin Invest. 2007;117(12):3658-3660. https://doi.org/10.1172/JCI34251. Chronic exposure to UV light is a risk factor for skin cancer in which signature mutations in the p53 tumor suppressor gene occur due to DNA damage and contribute to cancer development. In this issue of the JCI, Tang et al. report on their study of a nonimmunodeficient mouse model of UVB-induced skin cancer and human skin carcinoma cells and show that the mutant p53 conformation–modifying drug CP-31398 not only treats these tumors but also prevents them (see the related article beginning on page 3753). These studies have important implications for chemoprevention as well as therapy of common, mutant p53–driven tumors. 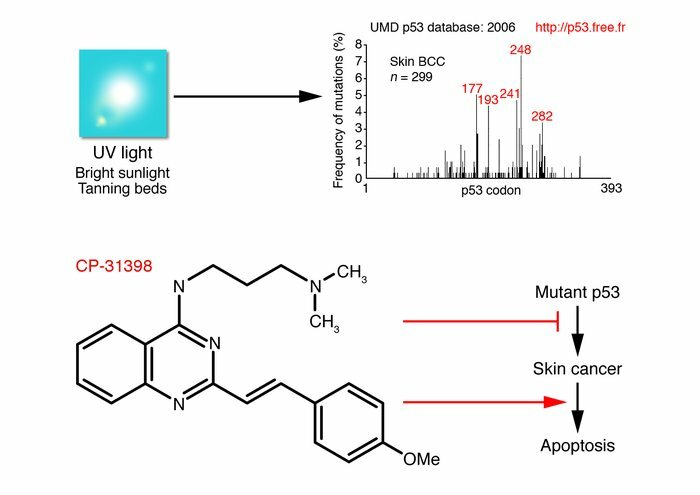 Targeting mutant p53 to prevent or treat UV light–induced skin cancer. UV light exposure from bright sunlight or tanning beds leads to p53 mutations that contribute to skin cancer development in most of the 1 million individuals diagnosed with nonmelanoma skin cancer in the US each year. In a report in this issue of the JCI, Tang et al. (17) demonstrate that CP-31398 (13) can prevent UVB-induced tumor development as well as serve as an effective treatment for tumors that develop in an immunocompetent mouse model. CP-31398 appears to promote apoptosis by restoring wild-type p53 activity to mutated p53, leading to increased proapoptotic Bax expression, reduced antiapoptotic Bcl2 expression, and cytochrome c release from mitochondria. The inset shows the spectrum of p53 mutations observed in human squamous cell cancer of the skin that is associated with UVB exposure (UMD p53 mutation database: http://p53.free.fr/Database/p53_cancer/p53_skin.html). Mutations occur at particular hot spots with greater frequency, leading to loss of p53 tumor suppressor function. BCC, basal cell carcinoma.